HAAAAAA!!!! Alex Trebek...You're right...He IS a douche! @Judy. Morning has come and the cold is starting to pass. I *think* people get my rants round these parts--or at least my humor gets humored. If you've got snark, the east coast is the place to be. No, I don't get you at all. 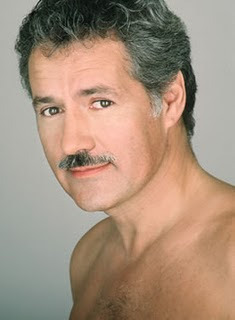 Where did you dig up the shirtless Trebek pic? He still manages to look smug in it, too...with his S&P hair over his ears and his trim S&P stache and his sparse chest hair. I really didn't need to know what was under his starched shirts. Do you think he read about the Alex Trebek effect in social psych textbooks and thought, "hey, that's right up my alley! Might as well run with it!" He's Canadian, you know. And he has looked about 50 years old for the last 20 years. How does he do that? @John search "alex trebek" in google images (but dont give away my image finding secret). And yes, i know he's Canadian. I mean, OF COURSE he is--just listen to the fake French accent. I read this blog post while you were lecturing about Yerks-Dodson Law. Had a good laugh, thanks! Also don't worry I took notes on the law.